AGA Campolin 2015 creation: The lever lock “Diana”. Diana is the roman Hunting goddness. Infact, this knife was thought for hunters and everyday use. It has the shape of a slim Catalana and the german leverlock mechanism. It is 21,5 cm longer and the blade measured 10cm. Is more thick than a regular leverlock (this is 3,5 mm) and the grind permit to make it very sharp. The liners are made with brass and the blade with 440 C steel mirror polished. 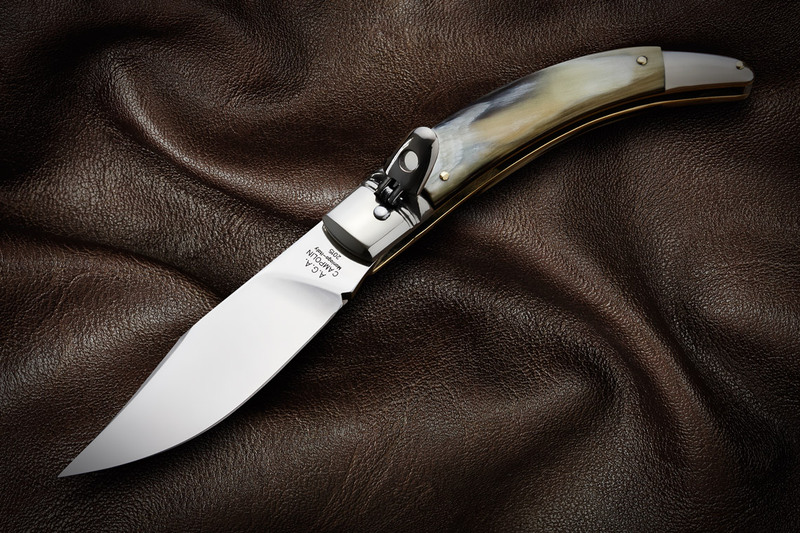 Nickel silver bolsters and natural scales give a touch of class to this knife. You will be well surprised of the superb quality of this knife. It comes with an handmade leather sheat. Overall Length: 21,5cm / 8.5"
Blade thickness: 3,5mm / 0.14"